In order to help the Primary children understand the historical theme they are studying, staff and pupils took on the costumes of 1939 to 1945 last week and carried the small cardboard boxes which would have held gas masks in war time. Primary children played the part of evacuees who were sent to live away from the cities with strangers, to save them from the risks that bombing and devastation had brought to those who lived near such war industry targets as the shipbuilders on the Clyde. The Secondary pupils were encouraged to dress up as adults in working garb and the staff joined in. There were Land Girls and factory workers and we have to mention Mrs MacIntosh’s elegant 1940’s style dress with her seamed stockings. It took considerable ingenuity at the time to ‘make do and mend’ and this was matched by the way in which our school rose to the challenge of creating some ‘living history’. At lunchtime our wonderful canteen ladies put on a fantastic ‘rationed’ feast and gave us all a taste of the resourceful and unusual food that people grew and ate on the Home Front in wartime. It is worth remembering that during rationing people became much healthier – no sweets and very little sugar, less meat and more vegetables – the opposite of our luxurious diet nowadays. 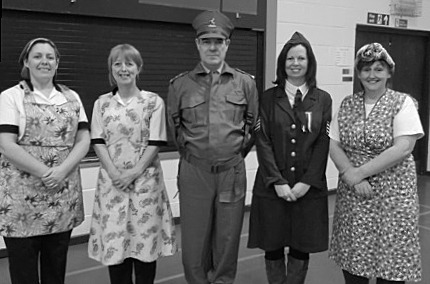 We would like to thank all those who participated in our WW2 event, especially Mrs Malcolm who, with the Canteen team and her cooking, has made 1939 to 1945 come alive for our pupils.